Groundwater is integral to many human and environmental systems but there are significant challenges in dealing with the impact of anthropogenic activities on groundwater systems. These challenges need innovative solutions. This book contains a wide range of content, from a discussion of the Australian regulatory framework for unconventional hydrocarbons, the extraction of which have the potential to significantly impact groundwater systems, to the best way to apply numerical models to help solve complex, real world problems. The impact of urbanisation on groundwater systems in the developing world is also discussed, at both a local scale in Nigeria and at a world scale. The use of innovative tools such as managed aquifer recharge, a critical tool in solving the groundwater challenges of the 21st century, is also discussed. The framework used to manage the legacy of agricultural contamination in Denmark, covering investigation to regulation and remediation, is also presented, focussing on how the many challenges in implantation were solved. 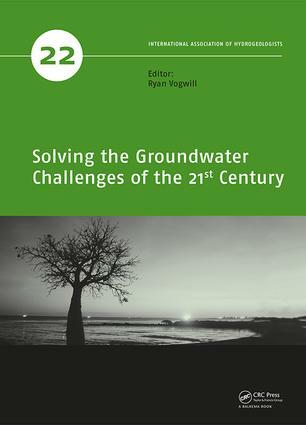 This book is targeted at professional hydrogeologists, experts in governance, law and policy as well as other professionals that need to incorporate an understanding of groundwater. The book will also appeal to politicians, resource managers, regulators and others interested in sustainable water supply. Originally from Canada, Ryan Vogwill (the convener of the IAH congress in 2013) joined the University of Western Australia full time in 2011 after having been part time since 2008. He had previously worked for the Western Australian Department of Water and Department of Environment and Conservation after completing his PhD at Curtin University. Ryan has been the spearhead for development and implementation of the Hydrogeology postgraduate coursework program at UWA. Ryan also supervises higher degree by research students and his research interests include; groundwater dependence of ecosystems, development of new parsimonious models for modelling of long term wetland dynamics and understanding mitigation of altered hydrological regimes, hydrogeology of microbialite bearing coastal wetlands, the role of groundwater in algal blooms in tropical Australia, plant tolerances and thresholds to altered hydrological regimes amongst other topics. He is currently developing proposals for developing models to predict long term mining impacts to valley floor biodiversity assets in the Pilbara, having been involved in the Australian chapter of the IAH since 2000, and having had many roles on the Western Australian State and National IAH committees.